A four year Hawk for Quincy, Steve had an immediate impact his Freshman year with a Player of the Week honor by Soccer America for his play. Other accomplishments Steve received was being named twice as a NAIA All-American and twice named to the NAIA All-Tournament team. An NSCAA All-American, Collegiate Senior Bowl selection. His role as two years tri-captain for Quincy, also showed the respect he received from his fellow players. His selection as Best Attacker, Steve also hold the Career Assists records and a Soccer America MVP Award in 1981. It seemed only fitting the in 1998, Steve was inducted into the Quincy University Hall of Fame and was named in the top 25 of the First 25 years of the program at Quincy. 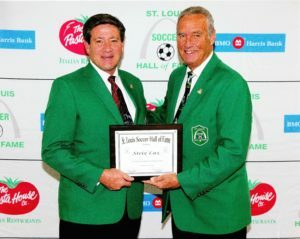 It was inevitable that Steve was inducted into the NAIA Hall of Fame in 2001. As a player returning to St. Louis, Steve played for the Kutis S.C. making it twice to the US Open Championships.